The nation’s railroads put technology to work every day. Here are just six innovations railroads have developed and deployed to maximize the safety and efficiency of the 140,000-mile rail network. 1. Track geometry cars measure every inch of track. Freight railroads use track geometry cars to identify anomalies in train tracks. The cars travel along the tracks measuring every foot for rail-wear, track alignment, elevation in curves, gage (distance between rails) and many other track geometry measurements. After the initial survey is complete, railroads quickly respond to any issues, keeping small problems from becoming big ones. Asim Ghanchi, General Director of Technology Services at BNSF, says that track geometry cars — including its autonomous fleet — allow BNSF to measure over 300,000 miles of track each year. “Inspecting that much track, that often, would be impossible without technology,” Ghanchi says. BNSF also uses machine learning technology to analyze data collected by track geometry cars, which allows them to predict track problems that may occur over the next 30 days. This flexibility means the railroad can complete maintenance at an ideal time, which maximizes safety and network efficiency. 2. Sonar helps protect bridge piers. Railroads use sonar to assess the stability of bridge piers. Sonar identifies increased erosion around the piers, which can compromise a bridge’s integrity. The sonar technology railroads use is similar to the echolocation whales use to understand their surroundings. Sonar sends out sound waves, which bounce off the bridge piers and the ground surface below the water. Then, based on the nature of the echo, railroads determine whether there are any concerns with the stability of the bridge piers. Railroads use sonar to assess bridges when significant water flow occurs following big storms or flooding events. This is especially useful when the water is extremely murky, making it difficult for a human diver to evaluate — or even see — the piers. 3. Smart sensors keep wheels turning. Smart sensors placed alongside track use a host of technologies — such as infrared and lasers — to assess the strength and health of wheels and bearings as they travel across the nation’s rail network. Overheated wheel bearings can lead to train derailments, so railroads use hotbox detectors to measure the temperature of bearings. When a bearing gets too hot, it can only safely travel another five to 100 miles. Canadian Pacific uses acoustic bearing detectors to predict when bearings will overheat three months in advance of them actually overheating. These sensors use acoustic signatures to evaluate the sound bearings make. By combining this data with the data collected by hotbox detectors, Canadian Pacific can find patterns in the acoustic bearing detector data that indicate when bearings could overheat. 4. Locomotive simulators safely train engineers. As a supplement to required field training, CSX uses tabletop locomotive simulators to train engineers on Positive Train Control (PTC), a set of innovative technologies that automatically monitors the safe operation of a train and can prevent certain kinds of human-factor incidents. Engineers virtually learn train handling procedures on different parts of track, seeing, for instance, how going down an incline will increase speed. They can also experience how the PTC system initiates by constantly assessing a large number of variables to guarantee the train has the necessary time and space to come to a stop safely where necessary to do so along the route. To create the simulator, CSX used a helicopter equipped with advanced imaging technology to capture detail about routes, including curves, elevation, track speed and even the location of buildings and overpasses along the track. At the end of 2018, the nation’s largest freight railroads were operating PTC across the vast majority — 83.2% — of the required Class I PTC route miles nationwide. The system will be fully active and interoperable by 2020. 5. Big Data makes railroads safer and more efficient. Today, railroads use machine learning to predict a number of maintenance issues — such as track wear and tear — based on patterns and trends found in huge amounts of data. 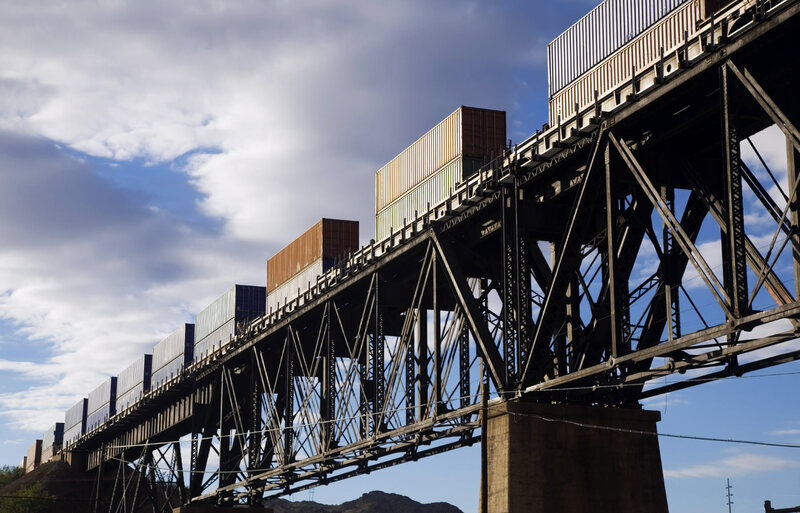 Using models and algorithms powered by machine learning and artificial intelligence, Norfolk Southern can predict wear and tear of track over a five-year period with a high degree of confidence. This five-year look-ahead window allows the railroad to proactively plan repairs and maintenance, helping make its network safer and more efficient. Track wear is only one of several different use cases for which Norfolk Southern has developed models to proactively leverage big data. And with so much data at its disposal, Norfolk Southern foresees many more exciting big-data applications on the horizon. 6. Machine visioning analyzes thousands of images. With machine visioning technology, Union Pacific collects 40,000 images per second of trains passing on tracks. A series of algorithms then analyzes the images to identify any anomalies, allowing Union Pacific to address issues faster than they could with manual inspections alone. The technology helps railroads look at many elements all at once, providing a comprehensive view of locomotives, trains and their components. Union Pacific now uses machine visioning in Nebraska, Iowa and Arkansas, and is exploring where to deploy it next.